Giving animals human attributes has a long history. Aesop’s Fables used talking animals to tell moralistic tales for social and political reasons. J.J. Grandville, a 19th century artist and political cartoonist created dressed animals, that look more like people with animal heads than animals in clothes, to use as social satire. 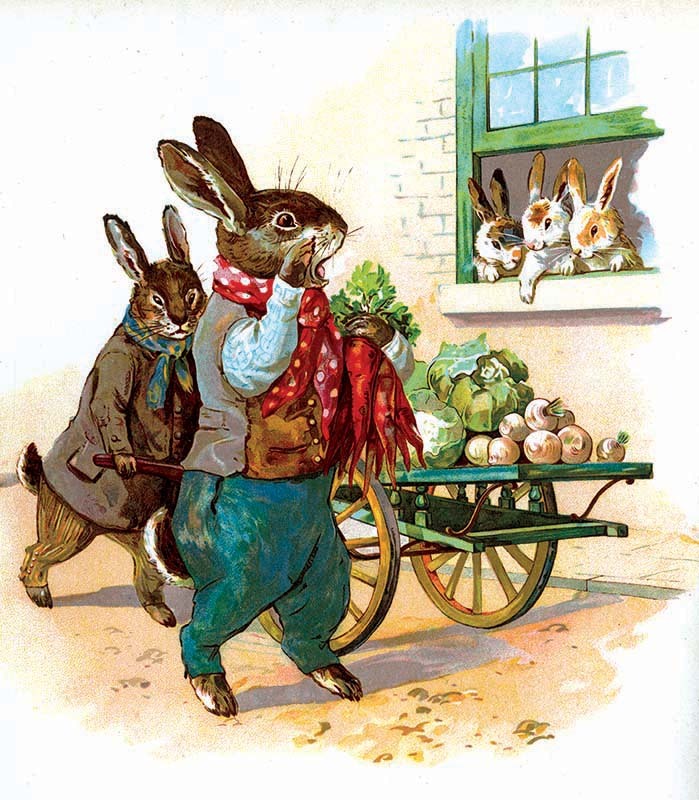 Children’s books have long been full of animals that talk, dress in clothes and do human activities. 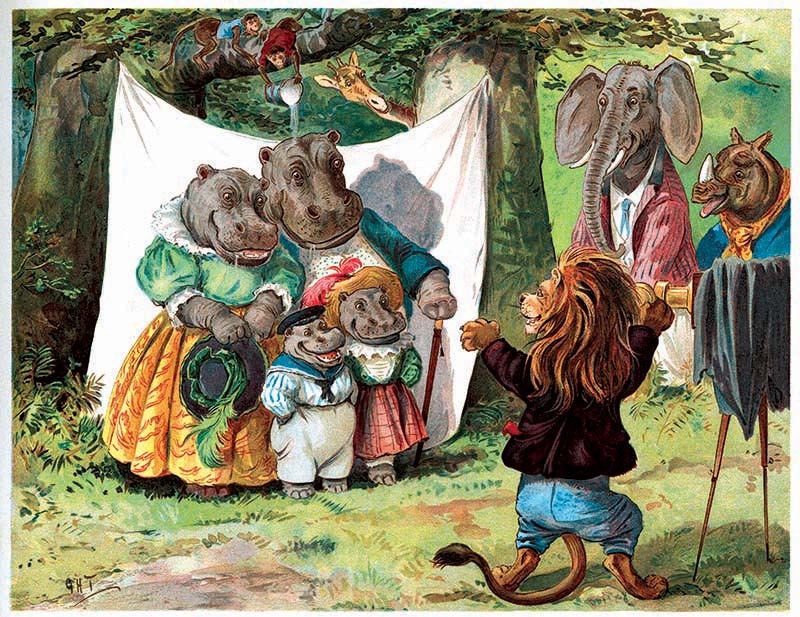 We at the Green Tiger and Laughing Elephant are delighted with all the ways illustrators have found to use clothes on animals and have hundreds of books featuring dressed animals in our collection. The following is from the introduction to A Field Guide to Dressed Animals, the book Benjamin Darling created with the posthumous collaboration of his father, Harold Darling, who had been collecting images for years with the intention of creating a book on dressed animals. “Animals have no need to dress, there is no animal, save the human animal, who needs wear clothes. As Genesis tells us: “And the eyes of them both were opened, and they knew that they were naked; and they sewed fig leaves together, and made themselves aprons.” The author makes no mention of the birds and beasts in the garden with Adam and Eve, even the snake is not required to dress, only humans. Thus when animals do wear clothes it is because they want to not because they need to, they have no requirement to ‘cover up’; they are never ‘ashamed’ of their bodies. They have no compulsion to do so. Not being able to communicate very effectively with animals, we humans must speculate on their complicated reasons for dressing in clothes. They obviously do so for a wide variety of reasons, not all known to the student of Animalia Vestido at this juncture in the scientific study. One of the main reasons animals dress is to appear more human. Animals (rightly or wrongly is it hard to say, as it is beyond the purview of this book) imagine that humans have all the fun. Homo sapiens are, in our role as ruler of the animal kingdom, in an enviable position and animals want to get closer to that role. Mimicking their habits and dress, putting on the costumes of their oppressor, is one way to do that. Animals, in part, wear clothes because they want to be human and enjoy all the benefits of humankind. 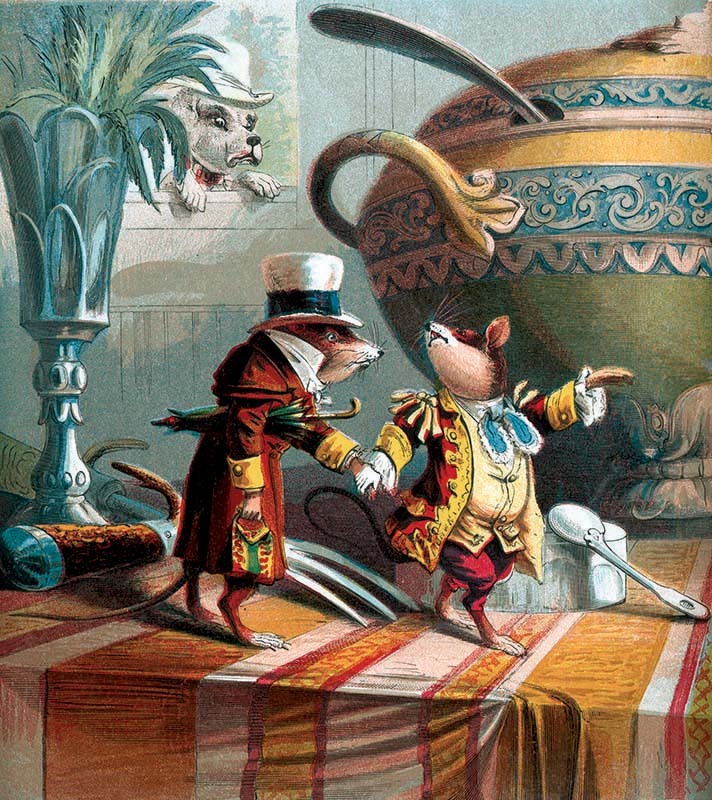 An illustration for a version of "The Town Mouse and the Country Mouse." "Animals also dress in clothes to signal to other animals, particularly those out of their immediate species, their standing or role in the animal kingdom. 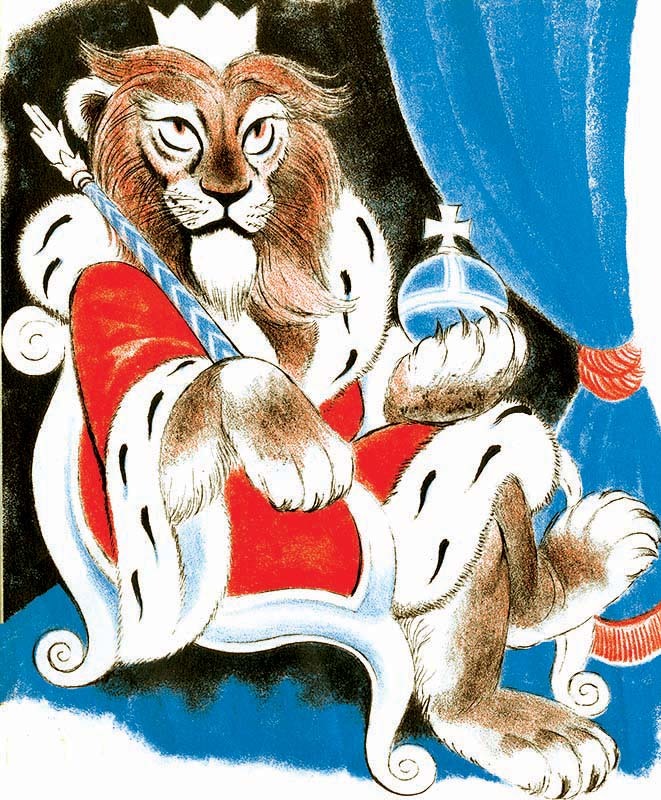 Thus the lion wears regal clothing in order to signal his status as king of the jungle to any passing monkeys, or other jungle inhabitants, who may have neglected to recognize the fact. Or, to use a more mundane example, the Sciuridae, or common squirrel, often dresses as postman or mailman, to signal his skill at gathering and delivering things. In fact in woodland communities in which there is mail delivery service, the squirrel will often take the role of mail delivery person. Like humans, the other members of the animal kingdom are interested in communicating their status and role to other members of society. Clothing helps to achieve that.